When the tattoo masters love lip operation using the smallest single needle, the needle machine speed 2 gear 1.5 mm, take “vertically into the needle, go back two three” needle acupuncture 1/2 operation from left to right continued connection operation lip, left thumb and three fingers in food, light tight lip surface forming segment the skin tension helps fast color, lip color is generally repeated three times. The operation should pay attention to breathing gently, do eye hand quasi steady speed uniform. Line well, full lips red effect on the success of the 80% run! Tips: beginners can take food in his left hand two fingers and refers to put on the chin, right hand finger pad on the method to manipulate the lip line, can greatly slow hand shake phenomenon, make the operation out of the slender smooth lip. More efforts will be able to do the best! 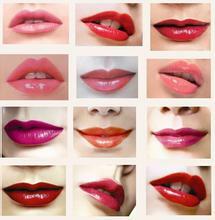 The key lip body touches is the choice of colors, techniques accounted for only 30% of the overall operation.